Posted on October 20, 2014 by F.H. In my Year 4 class, we have been using the F.R.I.E.N.D.S. For Life program. It’s a program based on resilience in children and I have found it fantastic so far (we’re just over half-way through the 10 week program…which has turned into 14 weeks based on time/excursions/absences…etc). This post isn’t about the program exactly, but about certain components that trickle through into adult life. The ‘R’ in F.R.I.E.N.D.S. stands for “Remember to Relax” and to introduce this to the students, one of the activities we did in class (and the teachers did at their facilitator training day) was ‘Milkshake Breathing‘. It’s all about recognising the emotional responses that your body can have and how to best deal with them. Today I had a student come to me after lunch asking me “What can I do when my milkshake breathing isn’t working?” He’d had a fairly rough day – brought about by his low self-esteem and equally low resilience – and I was so proud of him for seeking help and sharing his feelings with me. How often do we as adults give up the first time we try something? Through Art Costa’s Habits of Mind and our F.R.I.E.N.D.S. program, I feel that my class is understanding the value of persistence and attitude towards learning. But that’s what happens in the classroom. What happens outside the classroom is that teachers search for something on the Internet – can’t find it and give up. Other teachers have a difficult child and can’t seem to get through to them to make improvement – and then they give up. Over the last two years, I have witnessed many staff plan an amazing lesson using technology, only to have the server go down, the power go out, a website is blocked, or the students “don’t get it” – and they give up. If I gave up every time the technology in my lesson failed, I wouldn’t be a good role model to my students. I have asked students to chat to their partner while I fiddle with a cord, email for tech support, find another website that does the same thing… it doesn’t mean that I wasn’t prepared for my lesson – it means that I was able to be flexible. There have been countless times when I have quickly Googled how to export work that a student has done from one place to another, or asked a student in my class how to un-invert the colours on an iPad screen! Yes, I’ve planned my entire lesson around a video clip that we needed to watch at the start of a lesson…that was taken down by Youtube. We survived – I talked, the students listened and then we found another way around it, without the video clip. There should still be something to talk about in your lesson without technology. Always. I showed the image above to my students (remember, they’re only in year 4) the other day and we talked a lot about what it meant. We talked about working in pairs, with one student treating the other as the ‘elevator’ and just going along for the ride. 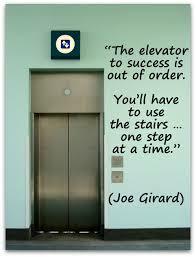 We talked about how when you take the stairs, a task takes longer – you don’t instantly get to the ‘top’. How do you get to the ‘top’? Do you require instant success? I’m based in the UK and I just wanted to add a quick comment here to say hello from across the other side of the world. Thanks for your comment Jen!